A wooden floor is a tough beast - and can function even when in a state of disrepair and damage, from wobbly boards to gouges and missing chunks. But why put up with such a sad state of affairs? 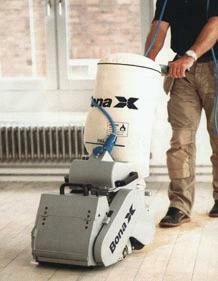 A specialist floor sanding, repair and renovation company can create a bright new floor within a few days. Call on Sanding Wood Floors for all floor repairs, staircase renovation, hearth removal and refinishing. A family company, we have restored hundreds of floors of all types: softwood, hardwood, engineered and parquet. And from all levels of condition in a variety of domestic and commercial settings. Over the decades, pine floors in period properties can suffer all sorts of indignities: from scratches, wear, flood damage and woodworm - to the modifications carried out by electricians, heating engineers and DIYers. An old pine floor often becomes a jigsaw puzzle of loose, worn and damaged boards -with the incongruous newer boards making the visual effect even worse. There are several stages to bringing such a floor back to shape. As in any job, adequate preparation is the key to the final finish, even before we bring on the sanding machines. * secure all loose boards. * relay any boards that are out of position. * glue, clamp and repair any split or damaged boards. * repair and plug the holes from old radiator pipes and cables. * where the timber is beyond repair, replace with matching boards from reclaimed sources. Staining after sanding and before sealing can also harmonise the tone of the boards to create a uniform ‘look’ to the floor. We can also lay reclaimed floorboards in rooms or areas where none exist, as in loft conversions. Here, reclaimed material is the best choice, preventing any possibility of the shrinkage from new pine boards. A basement, with its screened or concrete floor, can also benefit from the fixing of reclaim with specialist flooring adhesive. This comes down to personal choice. It provides an even look to the floor - and also helps to prevent draughts, particularly on the ground floor. * filling small gaps - 5/6mm - with a mixture of synthetic resin and fine wood dust. This is collected from the ‘cleanest’ dust from the final smooth sanding process. * wider gaps are filled with a fillet - tightly fitting strips of wood that have been cut from reclaimed Victorian boards. As the dried resin becomes very brittle, all the boards need to be highly secured. Some floors will require a mixture of the two methods in the same floor. Large gaps sometimes occur between the skirting board and the floor itself - often a problem in bay window areas. We can fill these to leave a smooth surface and clean edge. 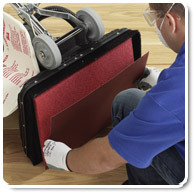 Call us today for your free assessment - when we’ll prepare a schedule of repairs for your floor. 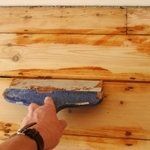 See our price guide for estimates on replacing floorboards and gap filling.